Glucose (sugar) in the healthy gut is used to transport nutrients, electrolytes and fluids into the body. In a damaged gut, such as in patients undergoing cancer treatment, the villi become blunted, leaving them unable to absorb glucose- bound nutrients and electrolytes. Additionally, glucose has been shown to stimulate chloride secretion (fluid loss/diarrhea) and weaken barrier function (cause for bacteria and toxins to enter the body) causing leaky gut. Research showed that enterade’s® decreases chloride secretion (decrease diarrhea and dehydration), improves barrier function (reduces leaky gut) and helps to rebuild the GI absorptive structures. 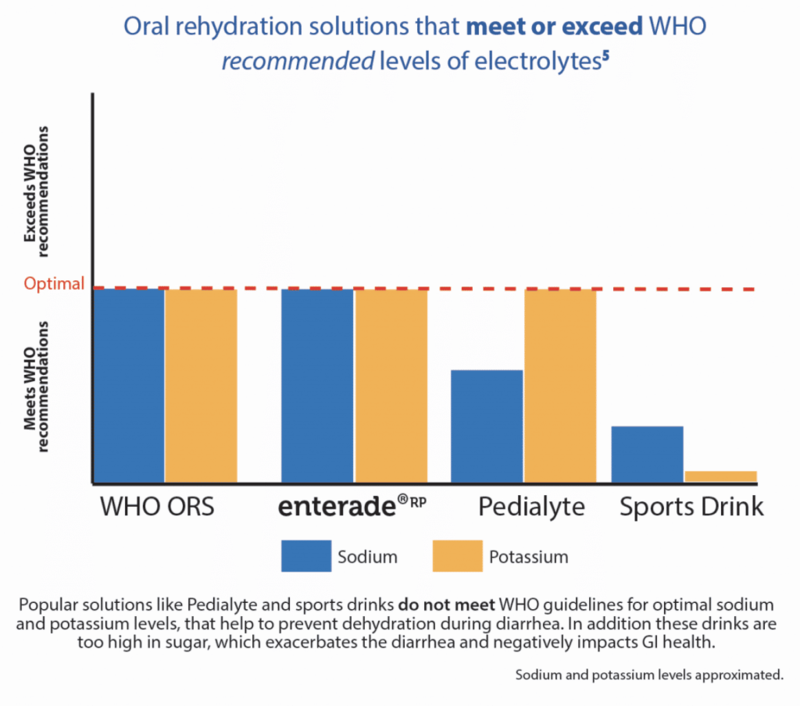 When compared to glucose-based s enterade® showed that is superior in providing nutrient and electrolyte absorption as well as it has greater rehydration. 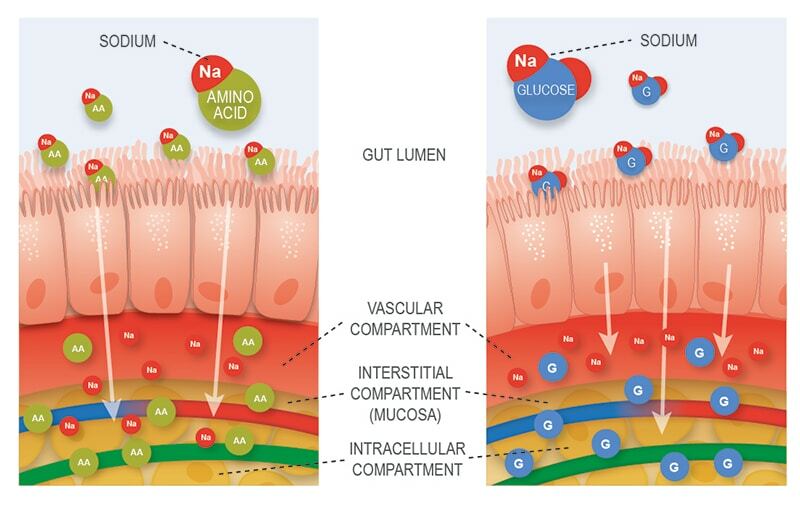 This image shows the select amino acids in enterade® provide better nutrient transportation and absorption than glucose. They help to facilitate hydration in three areas; the vascular space (blood vessels), interstitial area (the space in between the cells), and the intracellular area (inside the cells) to achieve total body hydration. Glucose is an inefficient transporter of electrolytes (sodium and potassium) that are necessary for rehydration – because glucose dissociates from electrolytes in the blood stream. On the other hand, amino acids do not disassociate and transport sodium and potassium not only into the bloodstream but also to the interstitial and intracellular levels for total body hydration.